This January, MIT had released their most recent iteration of Scratch 3.0. For those without young children, Scratch is a hugely successful platform for teaching children about computer science while encouraging creative play and exploration. Projects created can vary from animations to games and much more. The platform is web-based and comes packed full of assets for characters, background artwork, and music. You are also able to upload your own images and sounds with up to 50 MB allocated per project. Interaction with characters (called Sprites) occurs by dragging and dropping blocks of code in the proper sequence on the coding stage. With the new release, Scratch is now written in HTML5 (an upgrade from its previous Flash format) which means that Scratch projects are now mobile friendly! Other notable upgrades include the add-on blocks of text to speech and translation. Cause and Effect Interactive Experiences– you can customize the visual interactions with familiar images and objects. Experiences may also be supported by sounds and songs. Follow Direction Games– Using the text to speech blocks, you may create interactive games asking students to follow one to multi-step directions. Oh yes, and you can keep score! Checkout this starter project as an example. Visual Tracking Games– Using color detection blocks, simple to complex maze games are possible and endless. Other visual games include tracking a moving sprite to “catch” it. Attention Games– Using the hide and show blocks, a teacher may create games where sprites appear and disappear in random patterns and locations. The most powerful part is the ability to personalize games and experiences to make meaningful connections. And…. the learning curve is not too painful; even for adult noobs. Most projects can be “Remixed” which means that pre- built projects may be duplicated and then further edited or customized. Scratch projects have the ability to listen for “Events” such as keyboard strokes. 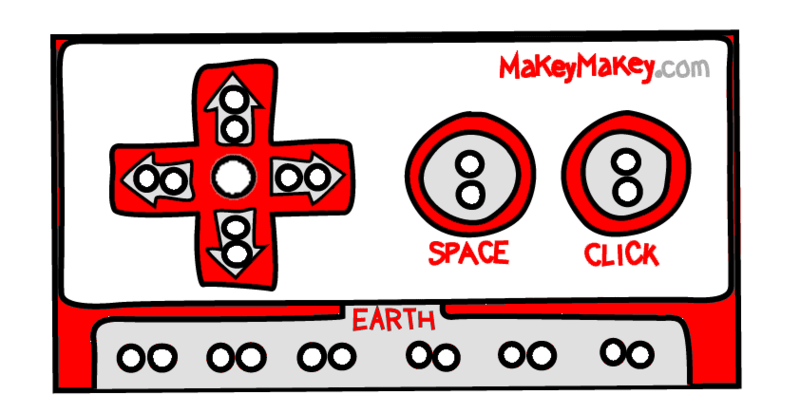 This functionality works beautifully with easy to use boards such as the Makey Makey. With limited experience and a few alligator clips, you can create a custom switch out of anything that conducts electricity. Feeling even more intrepid? Using an education board such as the Circuit Playground Express and some alligator clips you can customize which keystrokes to send or also trigger mouse navigation. This board can be programmed using another block based programming platform called Makecode. The Scratch website comes with great self paced tutorials that walk you through their most basic blocks and how to complete some of the most frequently used types of projects. Visit their tutorial page here. In the Neighborhood? Come Learn Together! If you happen to be in the NYC area, we will be hosting a beginner Scratch for educators and parents open house. The open house will be held on Saturday 3/30/2018 from 2 – 4 pm at the Moonbase Zero shop located in Prospect Heights Brooklyn.